Aah! What a crazy weekend it was. I did a crazy load of walking, shopping and antiquing, and bought this adorable retro telephone in a bright and cheery golden yellow colour. Two blocks down I found a pair of brand new pointed ballet flats in a perfect vintage-y pattern. See what happens when you put it out there? The universe delivers! 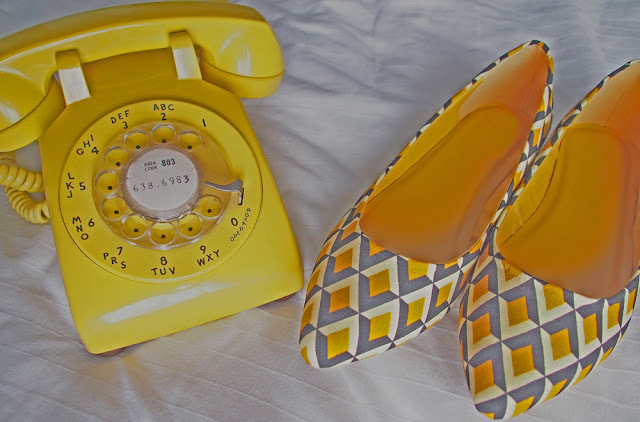 Just the other day I was blogging about how much I love yellow and grey, and look at exactly what came my way. Even though it works, the phone is going to sit as decoration, because believe it or not, the only working phone jack in our house is in the basement, behind the breaker wall. It wasn't that long ago that we used to use the phone jack for even the internet (a slow, painful experience that was) and now most teens don't even know what phone jacks are for. Dang I feel old... only to feel young at heart when looking at these awesome shoes. I just hope they are comfortable after an hour of wear.